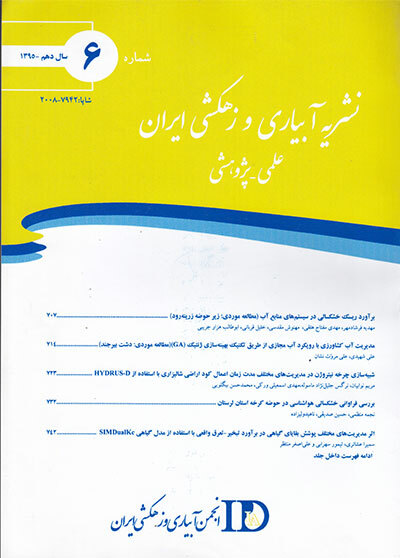 احمدی, تارخ, افراسیاب, پیمان. (1395). مقایسه الگوریتم‌های مختلف تحلیل آزمایش نفوذ بیرکن در منطقه سیستان. نشریه آبیاری و زهکشی ایران, 10(6), 810-820. تارخ احمدی; پیمان افراسیاب. "مقایسه الگوریتم‌های مختلف تحلیل آزمایش نفوذ بیرکن در منطقه سیستان". نشریه آبیاری و زهکشی ایران, 10, 6, 1395, 810-820. احمدی, تارخ, افراسیاب, پیمان. (1395). 'مقایسه الگوریتم‌های مختلف تحلیل آزمایش نفوذ بیرکن در منطقه سیستان', نشریه آبیاری و زهکشی ایران, 10(6), pp. 810-820. احمدی, تارخ, افراسیاب, پیمان. مقایسه الگوریتم‌های مختلف تحلیل آزمایش نفوذ بیرکن در منطقه سیستان. نشریه آبیاری و زهکشی ایران, 1395; 10(6): 810-820. در سال­های اخیر روش آزمایش نفوذ تک­استوانه­ای بیرکن به­دلیل کم­هزینه بودن و سادگی در اجرا بسیار مورد توجه قرار گرفته است. الگوریتم­های BESTslope، BESTintercept و BESTsteady الگوریتم­هایی هستند که از طریق داده­های آزمایش نفوذ بیرکن، خصوصیات هیدرولیکی خاک مانند هدایت هیدرولیکی اشباع (Ks) و توانایی جذب خاک (S) را تخمین می­زنند. هدف از پژوهش حاضر مقایسه سه الگوریتم مذکور در تخمین خصوصیات هیدرولیکی خاک و تخمین منحنی مشخصه و منحنی هدایت هیدرولیکی خاک است. برای این منظور تعداد 40 آزمایش نفوذ بیرکن در مزرعه تحقیقاتی سد سیستان انجام شد. مقادیر منفی و مثبت با خطای نسبی (Er) بیش­تر از 5/5 درصد از مجموع کل نتایج حذف شد و در نهایت تعداد 31 آزمایش در بافت­های لومی و لوم ماسه­ای انتخاب گردید .نتایج نشان داد که الگوریتم BESTsteady فرآیند محاسباتی بسیار ساده­تری نسبت به دو الگوریتم دیگر دارد. از طرفی مقدار Ks، S و منحنی مشخصه و هدایت هیدرولیکی تخمین زده شده با این الگوریتم با دقت بسیار خوبی مشابه نتایج به‌دست آمده از الگوریتم BESTslope (الگوریتم اصلی) بود. بنابراین می­توان نتیجه گرفت که الگوریتم BESTsteady در خاک­های لومی و لوم ماسه‌ای می­تواند به­عنوان یک الگوریتم کاربردی، جایگزین بسیار مناسبی برای دو الگوریتم دیگر و به­خصوص الگوریتم اصلی باشد. In recent years, the single ring Beerkan infiltration experiment has gained increasing attention as it is cheap and simple to implement. The BESTslope, BESTintercept and BESTsteady algorithms were developed to estimate the soil hydraulic properties (e.g. saturated hydraulic conductivity (Ks) and sorptivity (S)) through the Beerkan infiltration experiment. The purpose of this study is to compare these algorithms for estimating hydraulic properties, retention curve and hydraulic conductivity curve. For this purpose, 40 Beerkan infiltration tests were carried out in an experiment field in Sistan dam region. The negative and positive values with a relative error (Er) of more than 5.5% were eliminated and a set of 31 experiments in soils with loam and sandy loam textural classes was selected for the rest of analysis. The results showed that the BEST steady algorithm has the simplest calculating process and the Ks and S values as well as water retention and hydraulic conductivity curves estimated by this algorithm were similar to those obtained by the original algorithm with an acceptable accuracy. Therefore, it could be concluded that in soils with loam and sandy loam textures, the BEST steady algorithm is an appropriate alternative, which could be applied instead of two other algorithms. Bagarello,V., Di Prima,S., Iovino,M., Provenzano,G., Sgroi,A. 2011. Testing different approaches to characterize Burundian soils by the BEST procedure. Geoderma. 162: 141–150. Bagarello,V., Di Prima,S and Iovino,M. 2014b. Comparing alternative algorithms to analyze the Beerkan infiltration experiment. Soil Science Society of America. 78: 724–736. Brooks,R.H and Corey,C.T. 1964. Hydraulics properties of porous media. Hydrol. Paper 3. Colorado State University, Fort Collins. Burdine,N.T. 1953. Relative permeability calculation from pore size distribution data. Petroleum Transactions, American Institute of Mining Engineers. 198: 71–77. Di Prima,S. 2013. Automatic analysis of multiple Beerkan infiltration experiments for soil hydraulic characterization. CIGR Inter-regional Conference on Land and Water Challenges — Bari (Italy). 10–14. Di Prima,S., Lassabatere,L., Bagarello,V., Iovino,M., Angulo-Jaramillo,R. 2016. testing a new automated single ring infiltrometer for Beerkan infiltration experiments. Geoderma. 262: 20–34. Gee, G.W., Bauder, J.W., 1986. Particle-size analysis. In: Klute, A. (Ed. ), Methods of Soil Analysis. Part 1, 2nd edition ASA and SSSA, Madison. 383–411. Haverkamp,R., Parlange,J.Y., Starr,J.L., Schmitz,G., Fuentes,C. 1990. Infiltration under ponded conditions: 3. A predictive equation based on physical parameters. Soil Science. 149: 292–300. Haverkamp,R., Ross,P.J., Smetten,K.R.J., Parlange,J.Y. 1994. Three-dimensional analysis of infiltration from the disc infiltrometer: 2.Physically based infiltration equation. Water Resources Research 30: 2931–2935. Lassabatere,L., Angulo-Jaramillo,R., Soria Ugalde,J.M., Cuenca,R., Braud,I., Haverkamp,R. 2006. Beerkan estimation of soil transfer parameters through infiltration experiments — BEST. Soil Science Society of America. 70: 521–532. Minansy,B., McBratney,A.B. 2007. Estimating thewater retention shape parameter fromsand and clay content. Soil Science Society of America. 71: 1105–1110. Mubarak,I., Mailhol,J.C., Angulo-Jaramillo,R., Ruelle,P., Boivin,P., Khaledian,M. 2009.Temporal variability in soil hydraulic properties under drip irrigation. Geoderma. 150: 158–165. Mubarak,I., Angulo-Jaramillo,R., Mailhol,J.C., Ruelle,P., Khaledian,M., Vauclin,M. 2010.Spatial analysis of soil surface hydraulic properties: is infiltration method dependent? Agricultural Water Management. 97: 1517–1526. Parlange,J.Y. 1975. On solving the flow equation in unsaturated soil by optimization: horizontal infiltration. Soil Science Society of America. 39: 415–418. Reynolds,W.D., Elrick,D.E. 2002a. Principles and parameter definitions. In Methods of Soil Analysis, Part 4, PhysicalMethods, Dane JH, Topp GC (eds). SSSA Book Series, No. 5. Soil Science Society of America: Madison,Wisconsin, USA. 797–801. Reynolds,W.D., Elrick,D.E. 2002b. Constant head well permeameter (vadose zone). In Methods of Soil Analysis, Part 4,Physical Methods, Dane JH, Topp GC (eds). SSSA Book Series, No.5. Soil Soil Soil Science of America. 844–858. Reynolds,W.D., Elrick,D.E., Youngs,E.G. 2002. Ring or cylinder infiltrometers (vadose zone). In Methods of Soil Analysis, Part 4, Physical Methods, Dane JH, Topp GC (eds). SSSA Book Series. 5. Soil Science Society of America: 818–820. Wu,L., Pan,L., Mitchell,J and Sanden,B. 1999. Measuring saturated hydraulic conductivity using a generalized solution for single-ring infiltrometers. Soil Science Society of America.63:788–792. Xu,X., Kiely,G., Lewis,G. 2009. Estimation and analysis of soil hydraulic properties through infiltration experiments: comparison of BEST and DL fitting methods. Soil Use Management. 25: 354–361. Yilmaz,D., Lassabatere,L., Angulo-Jaramillo,R., Deneele,D., Legret,M. 2010. Hydrodynamic characterization of basic oxygen furnace slag through an adapted BEST method. Vadose Zone Journal. 9: 107–116.